Optical measurement technologies using cameras and lasers which do not affect airflow are utilized to measure information such as the pressure/speed of the flow field and deformation of the model. JAXA has developed three optical measurement technologies in its wind tunnel testing: pressure measurement technology using pressure-sensitive paint (PSP), which changes color in response to the pressure acting on the model; particle image velocimetry (PIV), which mixes microscopic oil particles into the flow to measure flow velocity; and model deformation measurement (MDM), which measures deformation and displacement of the wind tunnel model, including wing bending caused by lift. Conventional pressure measurement in wind tunnel testing required the installation of pressure sensors on the model. It was only possible to obtain pressure data at each point where a sensor was installed. Pressure-sensitive paint (PSP) is a luminous paint whose luminescence intensity changes depending on the surrounding pressure. By measuring the luminescence from PSP with a CCD camera, the pressure distribution can be measured as an image. It is possible to measure the pressure distribution on the entire surface of the PSP painted model. 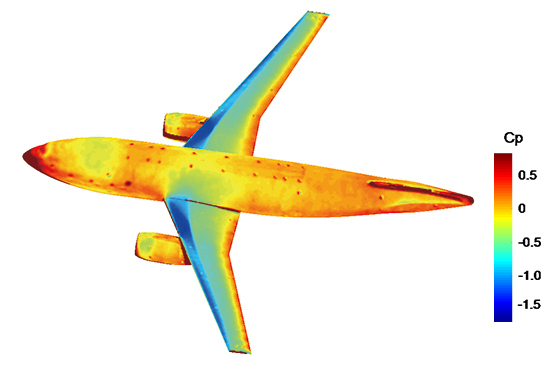 The figure below provides quantitative information and visual representation of the global pressure distribution on the aircraft model. Aiming to make PSP an efficient and user-friendly standard measurement technique, JAXA has introduced significant automation in the development and use of the JAXA backbone PSP measurement system that performs quasi-real-time processing of PSP measurement data in conjunction with the progress of the wind tunnel testing. Particle image velocimetry (PIV) measures the velocity distribution and direction of flow around a model, identifies vortices, and performs other assessments. Under the PIV method, the user mixes "tracers" - fine particles of oil around 1 micrometer in diameter - into the air and photographs the tracers as they pass through a laser light sheet. By then calculating the distance particles travel based on a comparison of two images taken at a given interval, the user can measure the velocity and direction of the flow containing the particles. 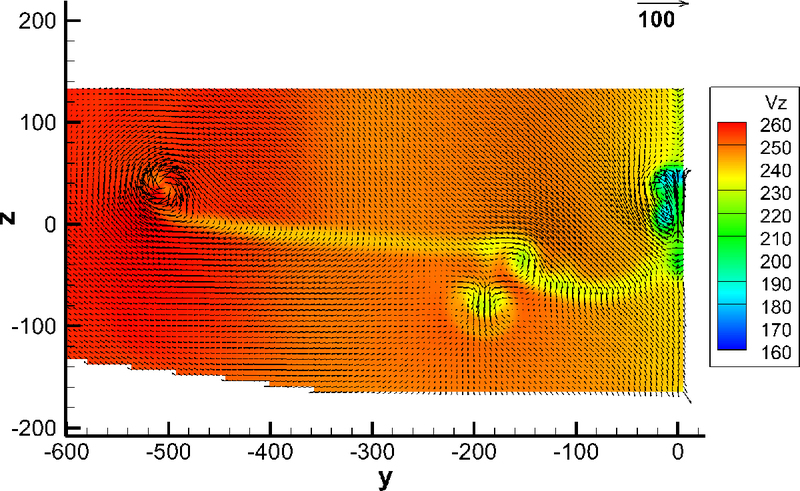 Each image shows tens of thousands of tracers, whose exact travel distances can be determined by performing computer-based statistical processing on the images. JAXA’s setup uses two cameras to photograph tracer images, enabling measurements of three-dimensional velocity vectors. Researchers are conducting a wide variety of tests to establish PIV as an increasingly versatile technology capable of measuring the velocity and directional attributes of the invisible flows around models in wind tunnels of all speeds - from low-speed tunnels to transonic tunnels. FLIGHT PATH No.9/10 Aeronautics in depth "Pressure-sensitive paint (PSP) measurement"
Sora to Sora No.22 "Measuring Global Pressure on a Model Surface"